o It is common knowledge there has been no substantive progress towards a new UN international agreement to control global greenhouse gas emissions with the latest 2012 Bonn talks ending in discord and disappointment. o ​​CO2 is being added to the atmosphere at 14,000 times faster than natural processes can remove it (Nature Geoscience 2008) making atmospheric CO2 increase at an unprecedented rate (IPCC 2007). o All atmospheric ​​greenhouse gas concentrations are maintaining and increasing trajectory (NOAA 2011). o An immediate global rapid drastic reduction in emissions would still lead to a global warming of over 3°C due to climate system science committed global temperature increase. o Climate experts think the world is likely now committed to 4° C (Climate change scientists warn of 4° C global temperature rise 2010), (Prof K Anderson and A Bows). o Because of the climate system inertia and momentum any temperature increase this century will almost double after centuries 2100 (NRC 2010). o Global warming lasts more than 1000 years (S Solomon PNAS 2010). ​At above 1° C billions of people lose availability of water and food and suffer increasing health impacts (IPCC 2007). o Arctic summer sea ice is collapsing (PIOMAS ice volume record) (Prof C Duarte 2012) with 2012 a record low extent by a wide margin. This is a planetary emergency. o The Arctic summer sea ice is in a meltdown situation and on a trend resulting in an ice free Arctic in a matter of years rather than decades according to extrapolation of current trend, (When will the summer arctic be nearly sea ice free? J E. Overland 2013, Prof Peter Wadhams (UK) public statements and W. Maslowski (US) - in as early as a few years. o All sources of Arctic methane feedback emissions are operant (Arctic Feedbacks Global Implications WWF. o Arctic sub sea methane hydrate destabilizing ( Warming Of Arctic Current Over 30 Years Triggers Release Of Methane Gas) (Methane Releases from Arctic Shelf May Be Much Larger and Faster Than Anticipated 2010). o Renewed increase in atmospheric methane due to planetary feedback emissions (E. J. Dlugokencky 2009) (NOAA 2011). Arctic methane is above 1900 ppb while the maximum atmospheric methane over the past 800,000 years is 800 ppm by the ice core data. o Ocean acidification is at an unprecedented rate in past 300 million years. ​​o Increasing global drought (Burke et al Hadley 2006), will increase further as Drought threatens most of the world(Dai 2010). Loss of Arctic snow and ice albedo cooling will increase and prolong the above drought even more. o The abstracts of the oral and poster presentations to the Arctic Ocean Acidification Conference,at Bergden, Norway, in May of 2013 may be read here. The conference was organized by the Arctic Monitoring and Assessment Programme (AMAP), the Institute of Marine Research (IMR), the Norwegian Institute for Water Research (NIVA), the Scientific Committee on Oceanic Research (SCOR), and the University of British Columbia (UBC). For every incremental increase in emissions there is an added global warming practically irreversible commitment (K Caldiera 2007). All crops in all regions will have declined below today's productivity at 2C (or probably less) NRC 2010. Global and regional N hemisphere extreme heat events and drought are increasing. Research has found that the increase in global extreme heat has increased 5X (Potsdam) and NH extreme heat (J Hansen New climate dice) are driven by global warming. 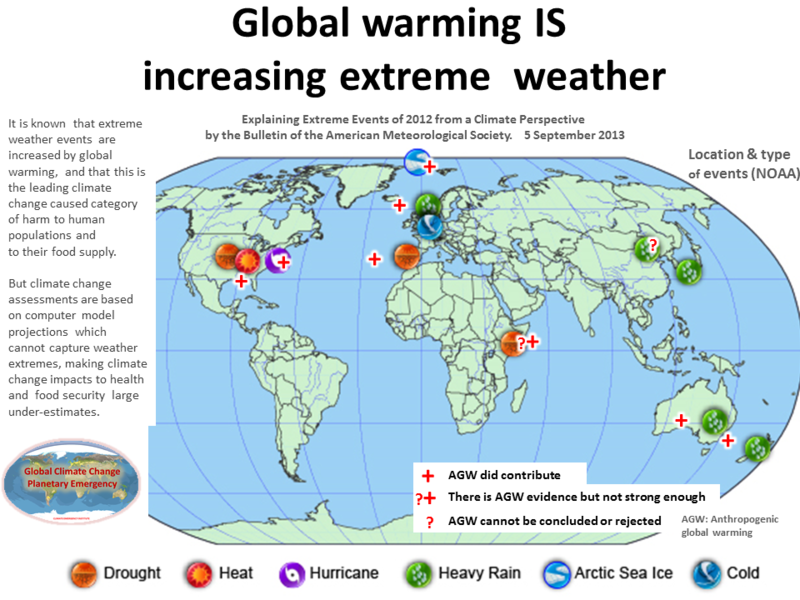 Increasing extreme weather events are a new large source of terrestrial carbon feedbacks (Climate Extremes and the Carbon Cycle Nature Aug 2013). Terrestrial ecosystems absorb approximately 11 billion tons less carbon dioxide every year as the result of the extreme climate events than they could if the events did not occur. That is equivalent to approximately a third of global CO2 emissions per year. The Arctic summer ice loss is past tipping point - strong warming feedback and increase N hemisphere drought. Field research (caves) by A Vaks 2013 of huge region of permafrost in Siberia finds that global climates only slightly warmer than today are sufficient to thaw extensive regions of permafrost and the permafrost will be thawed at a warming of 1.5C. Research in East Siberia of the El’gygytgyn meteorite impact crater shows that very degrees of Arctic summer warming (8C) have occurred in the past 3 million years at atmospheric CO2 concentrations around 300 ppm and this is due to Arctic feedbacks. All large Arctic amplifying feedbacks are operant - have been triggered. Satellite research shows a large increase in planetary methane emissions with Arctic methane emissions having increased 30% in 5 years. Ocean warming & acidification will destroy coral reefs in a matter of decades. Governments and almost all scientists have bought into the idea of of the long standing 2C equilibrium policy limit applying only to 2100, so the planetary emergency has been made much worse. The World Bank issues a science report warning we are being committed to a 4C world. 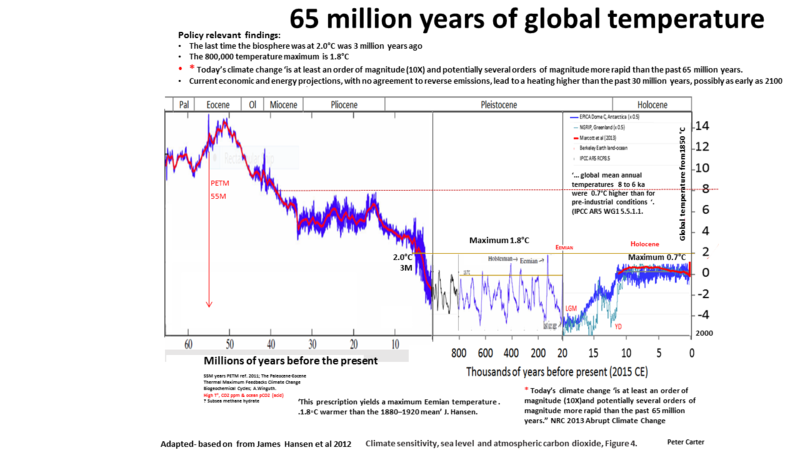 Policy (lack) has the world condemned to a literal end of the world the warming of 8C. ​​Combined national emissions reduction pledges filed with the UN for the 2015 Paris Agreement commit us a 3.5C-4.6C warming by 2100 which is 6C-8C full stabilized equilibrium warming after 2100 (Climate Interactive). ​There is no agreed limit to GHG pollution globally or nationally - even though 350ppm is widely considered the limit for atmospheric CO2, and the UNFCCC requires a safe level of atmospheric GHGs. 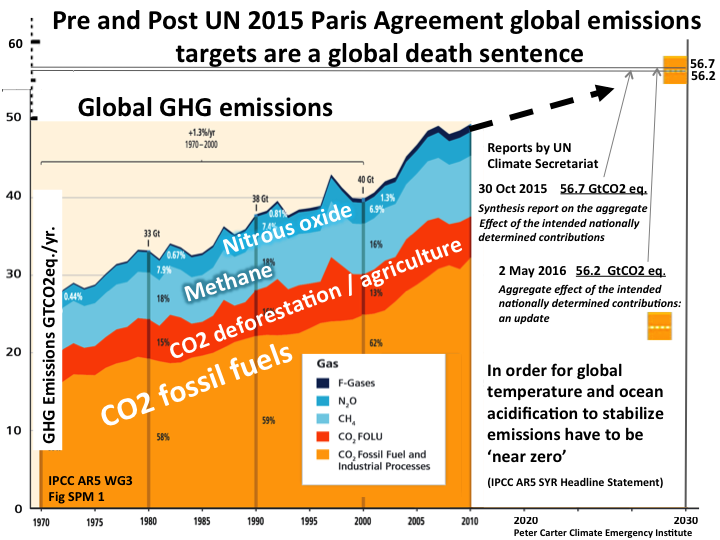 The only target is 2C which is certain global catastrophe - food, health, ecosystems, species and feedbacks. 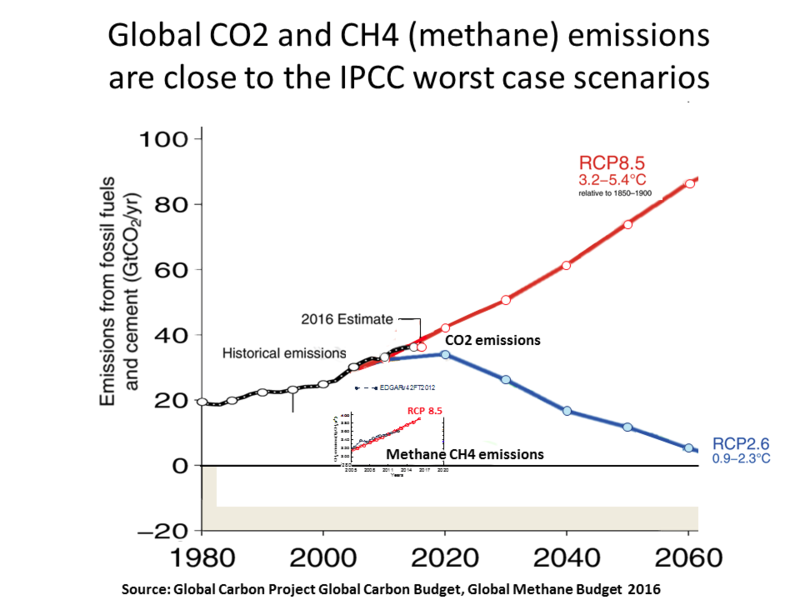 To make mattes much worse that 2C has been changed to 2C by 2100. ​​​The big economy States have delayed any new UN agreement to 2015 and delayed any actual new measures till 2020. There is no reason for any delay. ​All economy and energy plans globally and nationally are for increasing exploitation and combustion of fossil fuels. The DARA 2012 2nd Climate Vulnerability Monitor report estimates that climate change causes 400,000 deaths on average each year today, mainly due to hunger and communicable diseases that affect above all children in developing countries. Our present carbon-intensive energy system and related activities cause an estimated 4.5 million deaths each year linked to air pollution, hazardous occupations and cancer. This is most definitely an emergency. Even more so when ​​this death rate will greatly increase because global warming is committed to greatly increase. Comprehensive science assessments, like the 2007 AR4 IPCC assessment prove the 2C warming we have been targeting and the 3C that we are locked into, will be catastrophe for at least billions of people and catastrophe for world food production. A 2011 paper ​​Assessing dangerous climate change ... IPCC's ‘‘reasons for concern makes it obvious locked in warming puts us well into a extreme dangerous climate change emergency situation. Published in 2009 a major research study on planetary boundaries that we must not cross found we have already crossed the limits on global climate change and biodiversity. ​To avoid catastrophic environmental change humanity must stay within defined 'planetary boundaries' for a range of essential Earth-system processes, says Johan Rockström and his co-authors in a Nature Feature. If one boundary is transgressed, then safe levels for other processes could also be under serious risk, they caution Nature special.. 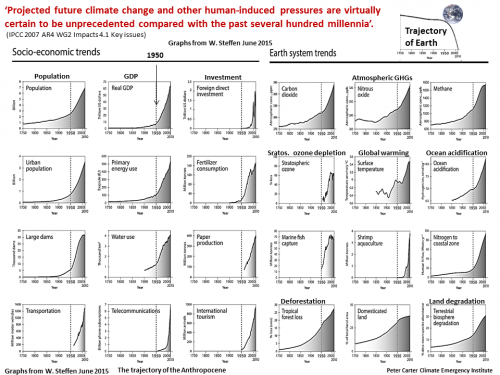 The assessment is published as Planetary Boundaries: Exploring the Safe Operating Space for Humanity The climate change boundary is one that has been crossed. VIDEO James Hansen 2008. WE need to be at 300 ppm or less. We are above 397 ppm CO2. ​As as Hansen repeated in 2012 after the big record sea ice drop, we are in a state of planetary emergency. ​​Russian researchers in 2013 have published 'Permafrost and the Destruction of Hydrates on the Shelf of East Arctic Seas as a Potential Cause of the “Methane Catastrophe”'. They conclude that the 'emission of methane from several areas of the Eastern Siberian Arctic Shelf is massive to the extent that growth in the methane concentrations in the atmosphere to values capable of causing a considerable and even catastrophic warning on the Earth is possible'. ​​​Unique in the field research of ​​Siberian permafrost caves by A Vaks published 2013 has found that 'global climates only slightly warmer than today are sufficient to thaw extensive regions of permafrost'. At a global warming of 1.5C the vast region of permafrost is thawed. Unique in the field research published 2012 of a deep lake formed by a meteorite in Eastern Siberia has found that the Arctic (warming) is far more sensitive to atmospheric GHG global warming over the past 3 million years. ​The Arctic has warmed 8C in the Summer in response to atmospheric CO2 of 300-325 ppm. Above 2C Locked into disastrous global climate change. The overriding reason why we are in a global climate change emergency is the total amount of future warming and climate change that we are already locked into, or committed to in climate science terminology. Without a drastic planetary emergency response now, we cannot avoid a warming of over 3C by 2100. A 2013 World Bank report warns we are locking ourselves into a warming of 4C. ​James Hansen has said 2C is disastrous and has published explaining 1C is now the danger limit, with 17 experts who co-author the paper ​(Assessing ‘‘Dangerous Climate Change’’: Required Reduction of Carbon Emissions to Protect Young People, Future Generations and Nature) 2C is accepted as the climate policy target, though a mojority of UN Convention nation Parties correctly want under 1.5C for their very survival. However to make matters far worse, unannounced the 2C limit has been changed, from the full very long term equilibrium warming to a 2C limit only by 2100. Any warming target obviously must be the stabliized equilibrium temperature. For 2C by 2100 that is in fact a full limit of 3.5C after 2100, due to the ocean heat lag. ​​The national UN pledges (even all carried out) puts the world at 3.5C-4.6 by 2100, which is 6C-8C long after 2100 (Climate Interactive 28 Sept 2015). These are unlivable temperature increases. Too late to avoid going far above 2C. Leading world climate change science advisor warns climate target 'out the window 'BBC News 23 Aug 2012. Professor Sir Robert Watson said that the hope of restricting the average temperature rise to 2C was "out the window". He said that the likely rise is 3 to 4C and may be as high as 5C - with dire consequences. He presented the situation to the 2012 American Geophysical Union conference. 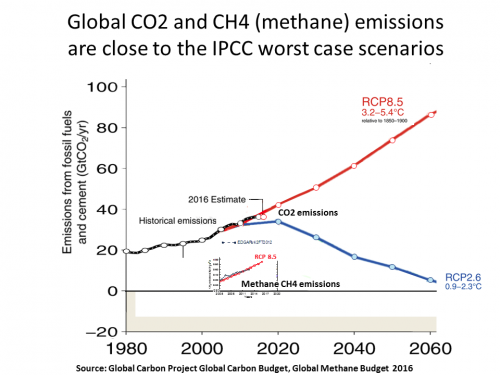 With an radical drastic emergency response it is theoretically possible to keep under 2C but Robert Watson's prediction was based on the reality there will be no such response because the national pledges made are so paltry. By definition any risk ​​of not stabilizing below 2C is a climate planetary emergency. Despite a 2014 slowing in the rate ​of CO2 increase, these are extremely fast rates. Emissions have to be zero so today's massive annual emissions 10GtC/billion tonnes of carbon keeps​ us on a fast track to planetary catastrophe. o Since the failed 2009 Copenhagen UN climate summit​ the focus has switched from emissions reduction to adaptation. ​o ​The international agenda is for no change to the situation till after 2010. ​o There is no world agreement or even a plan to reduce emissions. o UN negotiations on emissions are on hold till after 2015 with a view to a post 2020 climate agenda. o The locked in (practically unavoidable) global warming commitment is ​several times today's warming of 0.8C. There is a very long list of very damaging global climate change effects. People will be aware of a big increase in all kinds of extreme weather impacts over the past decade​, which has dramatically demonstrated how this category of global climate change impacts is the most damaging to human populations and to their food crops. These have all been caused by a global warming of 0.8C, but we are committed (locked in) to a future warming several times today's- without an emergency response now.​​ It is impossible to adapt to all these interacting increasing impacts​​- though we are bound to try. Long list of the general emergency reasons that proves we are all in a dire planetary emergency and must all push hard for an emergency response. ​Though as a catastrophe it is far from the worst, wee could already be committed to 20 meters or 70 feet. The Greenland melt is accelerating​. While multiple lines of evidence make it overwhelmingly clear that we are all in a planetary emergency situation (James Hansen 2008 , 2012), governments continue to delay any new UN measures to slow-stop GHG emissions, and assessments do not address the worst impacts and most catastrophic dangers. 4 Aug 2015 Accelerating global glacier melt 'unprecedented'. March 2015 ​​Shell-shocked: Ocean acidification likely hampers tiny shell builders in Southern Ocean ​shell making 24% decline large areas S. Ocean 17 yrs. ​Global Patterns of Extinction Risk in Marine and Non-marine Systems.20-25 % of the well-known species in our seas are now threatened with extinction -- the same figure as land living plants and animals. ​​Dec 2014 Maximum warming occurs about one decade after a CO2 emission. last >100 yrs. Without additional efforts to reduce GHG emissions , ... with a range to 7.8°C including climate uncertainty. (IPCC AR5 WG3 SPM p8). Sept 2014 ​​Warning times for species extinctions due to climate change Better risk assess. ​​July 2014 Amos Tai Threat to future global food security from climate change and ozone air pollution. July 2014 IPCC excessive governmental intrusion in the process. June 2014 Miroslav Trnka Adverse weather conditions for European wheat production will become more frequent with climate change.​​similar risk other crops. May 2014 Uncorking East Antarctica could yield unstoppable sea-level rise. M Mengel PKI Ice plug prevents irreversible discharge from East Antarctica. ​​April 2014 Abrupt increases in Amazonian tree mortality due to drought–fire interactions-beyond tipping point. ​​April 2014 M. Turetsky Wetlands causing atmospheric methane increase. April 2014 Don't wait till you feel it. K. Ricke Natural climate variability and future climate policy. 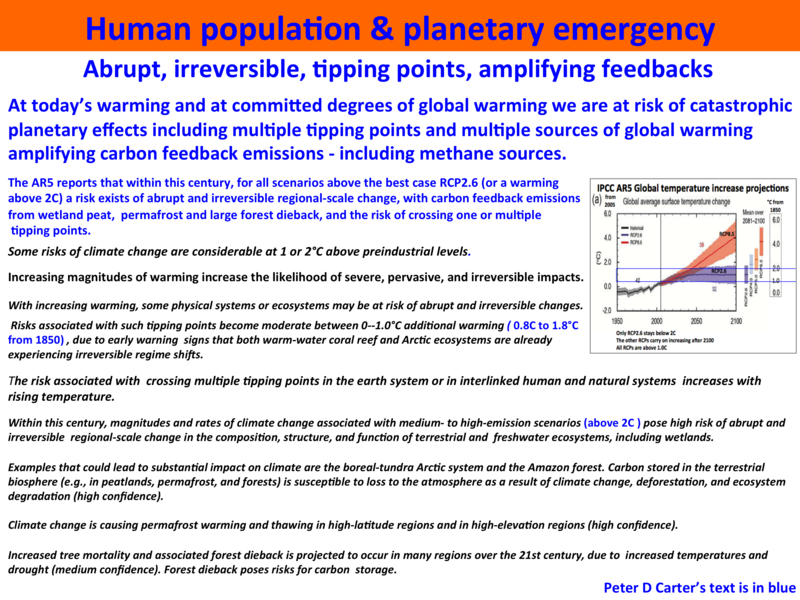 ​Tipping points: Early warning and wishful thinking. May 2014 West Antarctic ice sheetin irreversible collapse. Increasing worldwide disastrous climate change impacts already, and far greater committed ​(locked in) climate change should make the emergency obvious. Atmospheric CO2 is accelerating, at a 15 million to 20 million year high and ​the rate is a 20 million year high. Since 2000 concentrations of all three main GHGs are rising at an accelerating exponential rate. The post 2007 atmospheric methane increase is from feedback methane emissions. However the 'Intended' national emissions targets puts the world on track for 3.5C up ​to 4.6C by 2100, which is 8C after 2100 (full equilibrium warming) from Climate Interactive. This is certain catastrophe to the entire human population and almost all life (judging by past mass extinction events). World food production would collapse by 2050. ​industrial civilisation headed for 'irreversible collapse'? ​ bee pollinator colony death crisis due to pesticide use and climate change). ​Who does the emergency apply to? As shown (click above link) the list has grown fast over the past decade. ​​The fast changing Arctic is an emergency for the future of the life sustaining biospshere and life. Already committed (locked in) global climate change. 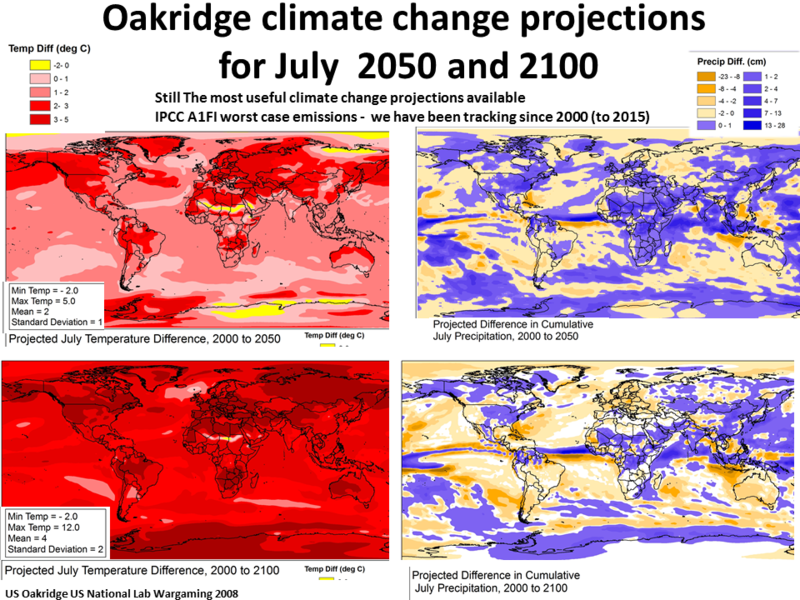 ​1.5C ​by 2030-2040 and 2.0C by today's atmospheric GHGs. ​(IPCC AR5 WG1). o OCEANS ​Atmospheric CO2 & GHG pollution are causing rapid ocean warming (now going deep) acidification and deoxygenation- a catastrophic triple assault. Warming + acidification is projected to lead to irreversible collapse, which would be disastrous for live on land. 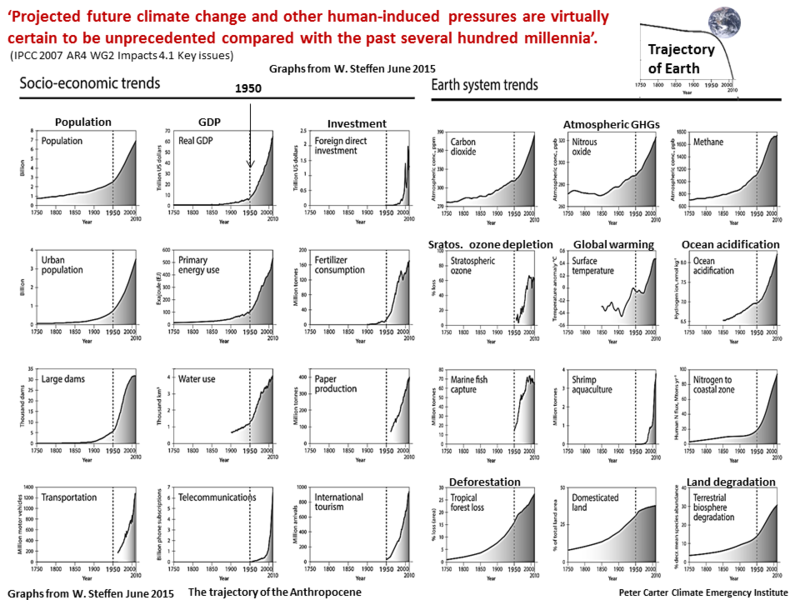 The most important IPCC finding ‘Projected future climate change and other human-induced pressures are virtually certain to be unprecedented compared with the past several hundred millennia’. 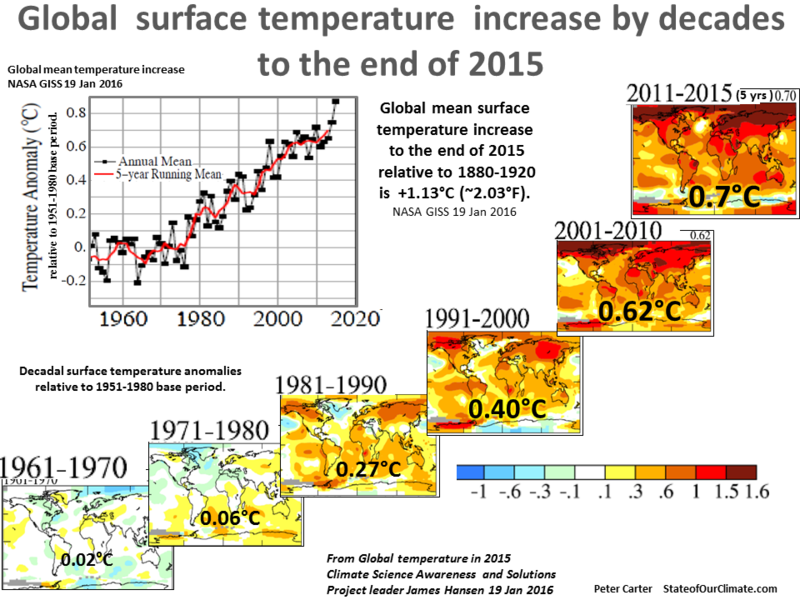 o From 2015 the global temperature increase is above 1.0C into the danger zone​. o ​In 2016 atmospheric CO2 and temperature rise were at a record and record increase in one year (boosted by El Nino) , even though industrial CO2 emissions (fossil fuel) did not increase in 2014 and 2015.
o Rate of ​industrial CO2 emissions is unprecedented in​ the past 65 million years , which 14,000 X faster than CO2 can be removed.